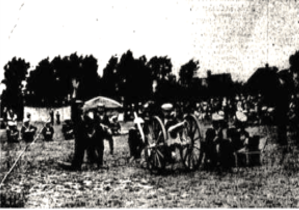 In each summer during the 1920s, a fair was organised in Gillingham Park to raise funds for the local hospital, St Bartholomew’s. The traditional climax of the event was a realistic demonstration of fire fighting and rescue by the Gillingham Fire Brigade assisted by local youth groups. Each year, a house of wood and canvas, three storeys and 40 feet high, was constructed in the park. The structure was the venue for a mock wedding reception at which two firemen, costumed as a bride and groom, would be entertaining their “guests” (other firemen, and boys recruited from local naval cadet and sea scout groups) when a fire broke out, necessitating the rescue of the occupants from the upper levels of the building. In reality, flares and smoke bombs were used to give the illusion of the structure being ablaze; only after everybody had been “rescued” from the building was a real fire set, to enable the fire brigade to demonstrate their fire fighting skills. On Thursday, the 11th of July 1929, this well-rehearsed demonstration went tragically wrong. For unknown reasons the fire had began on the first floor. It fiercely shot upwards blocking all the exits and trapping the occupants inside including young cadets and scouts between the ages of ten and fourteen. Initially the spectators, not realizing the fire was real, laughed and applauded as the boys cried out desperately for their lives. The fire brigade realizing at once the fire was real leapt into action. The crowd applauded more, still thinking this was part of the show. Eric Cheesman, a Royal Naval Cadet from the VCC in Chatham was one of many inside the house. His six year old sister Molly and their mother Elizabeth were in the crowd. It was Molly’s desperate screams which first alerted spectators that something had gone terribly wrong. “Eric’s burning, Eric’s burning” she cried, hardly audible above the applauding and cheering crowd. Others only realized the horror unfolding in front of them when they saw people leaping from the building in flames. A searchlight was shone onto the structure and people saw two of the boys leap from the burning building. Eye-witnesses, even many years later, recall vividly the horrific sight of a burned body of a boy half hanging over the edge of the roof, illuminated by the searchlight. it is also awful to realise that many relatives of the victims were present in the crowd and could only watch in helpless despair as their loved ones were consumed by the raging inferno. The fire was extinguished within a few minutes, but had been of such intensity that 13 people died at the scene. Two victims were rescued alive, but died of their injuries in hospital (the one for which they were trying to raise funds), bringing the final death toll to 15. Cadet Leonard Charles Searles (10). Cadet Ivor Douglas Weston Sinden (11). Cadet David Stanley Brunning (12). Cadet Eric Edward Cheesman (12). 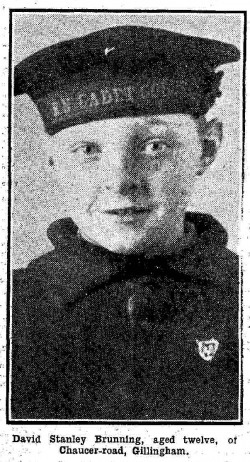 Cadet Leslie George Neale (13). Cadet Robert Dennis Usher (14). Scout William Herbert Jack Spinks (13). Scout Reginald Henry Lewis Barrett (13). Scout Leonard Gordon Winn (13). Petty Officer John Thomas Nutton (37). Fireman Arthur John Tabrett (40). Fireman Francis Bull Cokayne (52). Fireman Albert Joseph Nicholls (56). Marine George (Ronald) Mitchell (37). The funeral for the victims was held on the afternoon of Wednesday 17th July. Some of the boys had been associated with St Augustine’s Church (at the top of Rock Avenue) and so a special service was held there in the morning, with the bodies of five of the boys in the church. 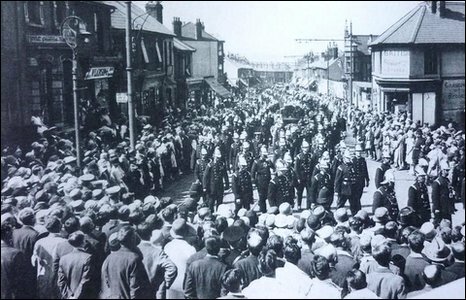 In the afternoon, thousands of people from all over the country packed the streets of Gillingham (see left) along the two mile (3.2km) funeral route. The funeral procession itself was a mile and a half (2.4km) long, and was headed by ten coffins carried on fire appliances covered with wreathes and with muffled bells, and five coffins draped with the Union Flag borne on gun carriages. All of the shops in the town were closed, and householders supplied drinking water to bystanders and marchers, which included several hundred firemen, as the weather was extremely hot. The procession began at the council offices in Green Street, and went up Canterbury Street, along Copenhagen Road, Gillingham Road and Livingstone Road to the cemetery in Woodlands Road, where a multi-denominational service was held, led by the Bishop of Rochester. The victims were buried facing the naval section of the cemetery. The graves of the victims had been left uncared for over the years and had fallen into a state of disrepair. Also, there was no public memorial to commemorate the event and the memory in the community of this tragedy and the lives lost was fast fading away. 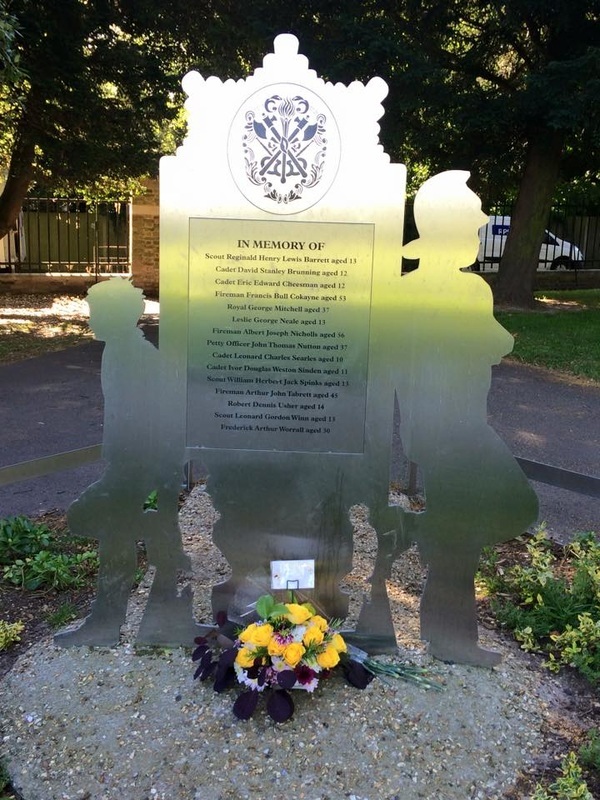 As a result of a campaign in March of 2010, Medway Council restored the remaining graves and erected a memorial in Gillingham Park to remember the fifteen lives lost and keep alive the memory of this tragic event. The new memorial (see right) was unveiled in an emotional ceremony on the 10 July 2011, the eve of the 82nd anniversary of the fire. Tragedy was to strike the VCC in Chatham again in in 1951 when 24 Royal Marines Cadets were killed in a road accident.